THE STORY - Migo is a friendly Yeti whose world gets turned upside down when he discovers something that he didn't know existed -- a human. He soon faces banishment from his snowy home when the rest of the villagers refuse to believe his fantastic tale. Hoping to prove them wrong, Migo embarks on an epic journey to find the mysterious creature that can put him back in good graces with his simple community. THE GOOD - A gorgeously animated film with a great cast that also includes an emphatic message about acceptance, curiosity, and cooperation. THE BAD - Occasionally feels a little too moralizing and the songs are lackluster at best. ​​​​​Based on an original story by Sergio Pablos, whose credits include being the creator of the "Despicable Me" franchise, “Smallfoot” is a film about curiosity, accepting those who are different than you and standing up for what you believe in. 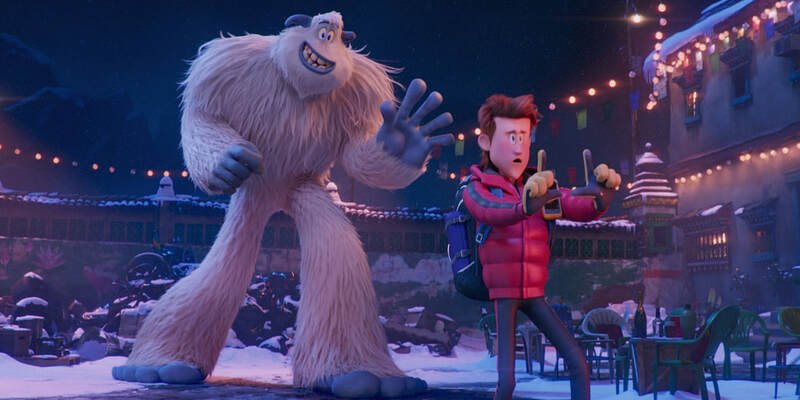 With a star-studded voice cast and classic story setup akin to a 90’s Disney animated musical, “Smallfoot” has all the makings of a quality film that both kids and parents can enjoy. Thankfully, it mostly lives up to that potential with an interesting narrative and by striking a good balance between a mix of silly entertainment for small children and attempting to provide a positive message. Wasting no time, “Smallfoot” begins by describing the creation story of a small clan of yetis that live on top of a Himalayan mountain. It presents their society as a happy place that is kept that way by strict adherence to the rules which are enforced by the leader of the tribe, the Stonekeeper. Any disobedience or even questioning the stones is akin to heresy. Migo (Channing Tatum) is a young yeti with a bright future as he will soon become the yeti that brings the morning to their village by striking a gong with his head after a flight by slingshot. When it comes time for Migo to practice, he misses his target entirely and goes flying over the crest of the village. On the outskirt of the mountain, Migo runs into a crashed airplane and pilot but before he can bring the man, which the yeti’s call smallfoot, back to the village the man's parachute is caught by the wind and he is swept over the edge and down into the clouds. When Migo brings his story back to the village, he is banished for refusing to lie about what he saw, as the stones explicitly state that there is no such thing as smallfoot. It doesn’t take long before a secretive group of yeti who believe in smallfoot, lead my MeeChee (Zendaya) the Stonekeepers daughter, finds Migo and invites him to join them. Migo is determined to prove he wasn’t lying and he soon finds himself going down into the clouds to see if he can find one to bring back to show the village. He ends up finding Percy (James Cordon), a nature show host who is desperate for ratings and makes off with him in the middle of the night. Percy is initially terrified but after Migo saves him from a bear, Percy decides to accompany Migo to see if he can get some footage of a yeti to boost his show into the big leagues. When the two return to the village it sets in motion a series of events that will leave Migo questioning everything he knows about his own society and just may bring about a momentous change for both yetis and humans. “Smallfoot” gets most of the basics right, with gorgeously detailed animation that takes advantage of the beautiful scenery of its setting, great voice acting, and a well-written story. Channing Tatum and Zendaya are charming and funny and while James Cordon oversells most of his lines it fits well with the animation of his character so it’s less noticeable than it might otherwise be. Unfortunately, the songs do not live up to the rest of the film and it may have something to do with the fact that they were written after production had started as it wasn’t initially planned as a musical. All of them seem a bit tacked on and the film wouldn’t have suffered the slightest from them being cut and in the case of an atrocious rewrite of Queen’s "Under Pressure" it would have been much better. The basis of the conflict for "Smallfoot" rests on the fear and distrust of other societies, something that feels all too appropriate for our current world. Later in the film, a rap song from Common makes it crystal clear that this feeling is intentional and while the obvious messaging is sometimes a bit much, the movie is aimed at fairly young children, think the 8 and under crowd, so it’s easier to look past it. “Smallfoot” is generally a good kids movie despite the uninteresting songs and slightly overbearing moralizing. It may not become a classic but it is still a fun watch.